It's time for Migration Assistant. With macOS, you can set up your Mac with separate user accounts. That way, multiple people can use one computer, but the files, app settings, and other data for each user are kept separate from each other. But what if you have two Macs, and you want to move a user account from one Mac to another? Macworld reader and newlywed Nolan wrote in with questions about just such an activity. He and his wife want to migrate his account from a computer he owns to her Mac, and he’ll sell his old computer. Each of them have separate Time Machine backups. He has Backblaze running for cloud-based archiving on his computer. His wife’s Macbook doesn’t have enough storage to let him use his Photos library in place, so he wants to move this to an external drive. What to do? Since they’re already making Time Machine backups (good data hygiene, Nolan! ), it’s the right place to start. But the large Photos library could complicate matters. Copy the Photos library (and any photos or videos not imported that you want to store with it) to an external volume, as well as any files you need to reduce the size of your user account to migrate it successfully to the other computer. Perform a manual Time Machine backup of that old computer (Time Machine menu > Backup Now). Force a Time Machine backup again. Unmount the Time Machine volume from one Mac, and mount it on the other Mac. Launch Migration Assistant (Applications > Utilities). Follow the steps until you reach the Select Information to Transfer screen. Uncheck all the boxes but the one for your user account to import. Click Continue and wait for it to complete. Migration Assistant can be used to just import a single account from another device or a backup. Your account and associated files from your old machine are now ready on the new one. You may have to copy applications manually or reinstall them, however. And you can have issues of apps were purchased across multiple Apple ID accounts, too. As for Backblaze, the software offers an option called Inherit Backup State, which retains your old backed-up files at its servers, and doesn’t upload again files it’s already got fresh copies of. This would include your account’s files, of course. Make sure you have your external drive with photos and other media attached so you can add that to the backup set, too. 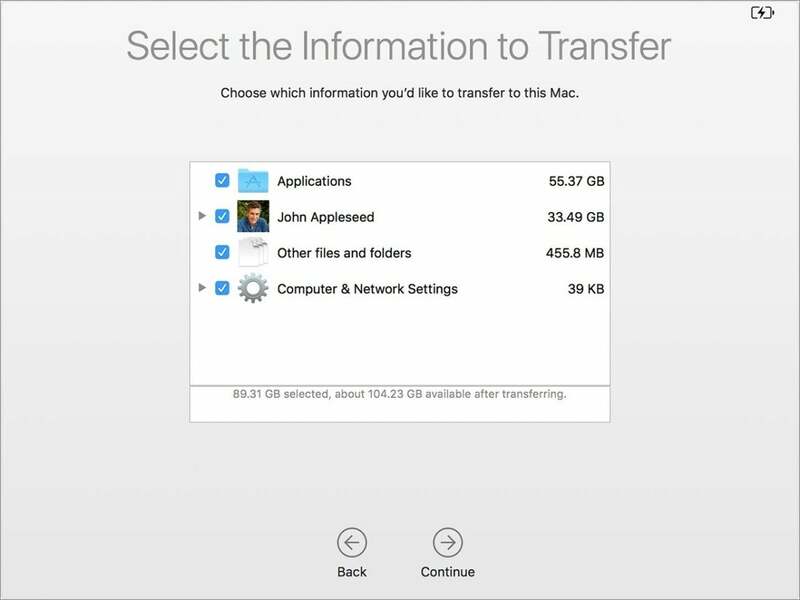 Meanwhile, retain the Time Machine backup of the old Mac for as long as you can as an added backup while new archives are formed in Time Machine and Backblaze.